Perhaps it was the aura of his opponent, a fighter with a preternatural—grotesque even—capacity for violence. Or maybe it was the troubles both professional and personal dogging him. He was the opponent that night, too; that designation—loudly confirmed by a crowd eager to see him scalped—felt especially ominous. And who could ignore the commentators’ narrative? They had their ideas about who was the future, who the past, and were hedging accordingly. Under these influences one couldn’t see him standing at the mouth of the tunnel, wrapped in funereal black, and not wonder: will tonight set this once-rare fighter on the path to a common end? Kissing his gloves to that same hostile crowd, tapping the fist of a conspicuous supporter, he offered a dimpled smile, one that flashed . . . red, white, and blue? A mouthpiece? During his ring-walk? Of course. A fighter born, bred, battle ready, living the only life he was constituted for—he was this before all else. And with that image the pall over this trip up the gallows faded just a bit. It was just a prizefight after all. How absurd to count him out in one of those. 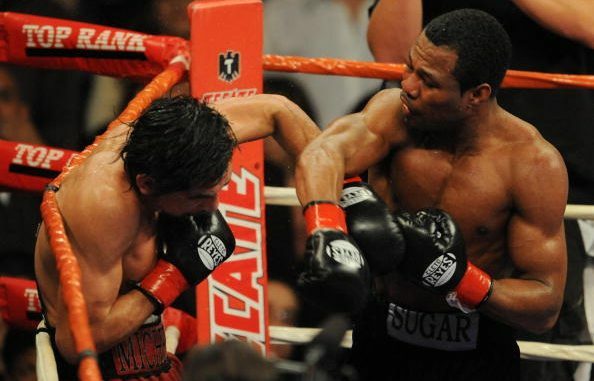 “Sugar” Shane Mosley faced Antonio “El Tornado de Tijuana” Margarito on January 24, 2009 at Staples Center in Los Angeles in what was supposed to be a coronation. Margarito had battered undefeated WBA welterweight champion Miguel Cotto into submission in a night of ultraviolence the previous July. Cotto was one of Top Rank’s best and most bankable attractions yet, at the time, the residuals of that blood red Las Vegas night tempered expectations about his return. At least in Margarito, then 37-5 (27), Top Rank had an archetypal Mexican fighter, indefatigable, ruthless, pledged to and embodying the spirit of machismo worshipped by his people. His brutalizing of a Puerto Rican fighter, that burning image of him menacing over a kneeling Cotto, only further endeared him to his acolytes. Mythologized in the aftermath of his win over Cotto, Margarito appeared a monster set upon the division to the glory of boxing’s most passionate devotees. What he needed next was a ceremonial victory in his kingdom, before his court, to fix himself firmly upon the welterweight throne. Mosley seemed the perfect foil. Then thirty-seven, seven years Margarito’s senior, he had fought but once since losing to Cotto in 2007, a twelfth-round knockout of shopworn Ricardo Mayorga. And he was mired in drama. A prominent figure in the BALCO steroid scandal, Mosley admitted to taking the company’s designer steroids. His reputation was under attack. His litigation with BALCO founder, Victor Conte, was ongoing. His marriage, however, was not; nor was his working relationship with his father, Jack, who had instilled the “power boxing” style that once made Mosley such a sensation. Mosley broke training camp for the Margarito fight to finalize his divorce, a training camp guided not by his father, but by Philadelphia fixture Naazim Richardson. If ever there was a time to catch Mosley, 45-5 (38), unfocused this seemed it. If he had, if Margarito had done what he and many others expected him to do, what might have transpired? Surely something different. Because Margarito-Mosley was no war—it was an execution, surgical and savage. Mosley’s already-fast hands were blindingly so in contrast to those of the lumbering Margarito. Hand speed can be frivolously employed but Mosley—especially early—used his to staggering effect, firing quick jabs to the body to set up whipping overhand rights around Margarito’s guard. His lead hook, the punch that flattened Ricardo Mayorga in his previous fight—spun Margarito’s head like a weathervane in a storm. None of these punches, however, had the effect of the right he tore through Margarito’s guts forty-five seconds into the first round, one that buckled, if only for an instant, the supposedly indestructible fighter. Another right to the body saw Margarito raise his eyebrows; a gesture that, despite his henchman’s demeanor, saluted the punch’s effect. While Mosley worked, the HBO commentary team revealed the prefight intrigue that unfolded in Margarito’s dressing room. Richardson had objected to the way trainer Javier Capetillo wrapped Margarito’s hands and this ultimately led to officials confiscating a mysteriously hard, wet, knuckle pad. While Margarito was later banned for a year as a result of the incident, the purpose of mentioning it here is neither to paint the Margarito camp as criminal nor offer an apology for Margarito’s performance: for Margarito, in his professed innocence, could have surely fought spiritedly despite the distraction? No, the point of mentioning the wrap controversy is to make clear that the fight was on the up and up, however quickly it took a downward turn for Margarito, and however suspicious his career has become since. The next two rounds were marked by Mosley’s dominance, his staunch refusal to allow the Tijuana fighter to generate momentum. Slipping a jab, Mosley countered with a hook and a cross that drew a smile from Margarito; seconds later, in one of the fight’s iconic moments, Mosley reached out to parry Margarito’s uppercut (as you are trained never to do) and then blasted the sweat off Margarito’s head with that same right hand. When Margarito finally landed a right of consequence Mosley cracked him back in retaliation. Already the mood in Margarito’s corner was nothing like it had been against Cotto, where Capetillo had assured his fighter the knockout would come. Instead, Capetillo, already urgent and concerned, implored his notoriously slow starter to get working. Capetillo was understandably animated, for even with nine rounds to go Margarito was running out of time. Mosley had already blunted his attack, punished him for it, silenced the crowd. Because Margarito was a slow starter, because his razing of Cotto had defined Margarito as a sort of undead stalking inevitability, Mosley’s auspicious start was underappreciated. Yes, Mosley’s physical and mental toughness had been overlooked. This was a fighter who was nearly decapitated by Vernon Forrest, who later that fight suffered a body shot that made him scream, yet even in defeat fought desperately. A man with that much spirit would take some discouraging. Margarito had done nothing to discourage him. With those words, Richardson sent Mosley out for the fifth round. And while charming in their idiom, they seemed almost too cautious: for by this point Mosley had Margarito solved and, really, what could a fighter wedded to attrition offer in response? In round three, when the narrative was still being sketched, Merchant remarked that Margarito “believes that to take a backward step is treason.” Oh, but he had taken them against Mosley—and treason has its penalties. Moreover, Margarito–Mosley didn’t fit neatly into the matchmaker’s calculus. Margarito, the pressure fighter, eventually wore Cotto, the boxer, down. But Mosley, while a better boxer than Margarito, was the puncher in this matchup—and it is punching power that undoes the pressure fighter. Mosley drove home that message with every punch. With his talk of grease and swimming, Richardson gave Mosley a strategy that would keep him safe, would keep him in control of what seemed a foregone conclusion. But Mosley was right, he did not have to fear the exchanges, and so he did what he had throughout his career: he pursued the purest outcome in sports. In the eighth round, with the anxious crowd pleading more than cheering, Margarito stepped into a 1-2. Mosley took a half step back and shifted into southpaw as he threw a right uppercut in response. The punch only grazed Margarito but it froze him. Seeing his moment, Mosley launched a left hand that detonated on Margarito’s chin. Mosley pounced on his stumbling opponent, staggered him with a right and pursued him across the ring where he sent Margarito into the ropes with a left hook. Merchant noted that Mosley should have been credited with a knockdown since the ropes held Margarito up, but the knockdown came anyway, courtesy of two right hands Mosley drilled into the side of his defenseless opponent’s head. Margarito beat the count, and the bell saved him, but he rose needing greater mercy. As the round ended Mosley extended Margarito a glove, a gesture Margarito accepted with a smile that fell when he turned vacantly to his corner. Send him out they did, where Mosley was waiting. He trapped the still woozy Margarito on the ropes and dug in. Five unanswered hooks later and referee Raul Caiz Jr. could allow no more. As Caiz wedged his body between the fighters a white towel flew in from Margarito’s corner and Mosley as if in response, mirrored the mercy of Capetillo’s towel with a final pitiless shot. Steward said Mosley would pursue the knockout to the end, remember? Amidst the chaos of his rescue, Margarito collapsed to the canvas. “And Shane Mosley has annihilated Antonio Margarito!” gushed an awestruck Jim Lampley; that call, in its simplicity, incredulity, reverence, was perfect. 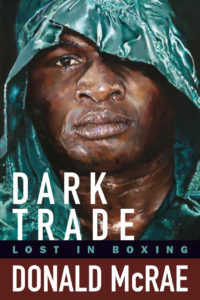 Merchant, in his slow deliberate way, found words to celebrate a fighter he more than once professed his love for: “Can. That. Man. Fight!” That man, the least surprised one in the arena, bowed twice. Minutes later, as Michael Buffer read the result, as Mosley, his hands triumphantly raised, had a t-shirt yanked over his frame, he began to speak. The words were indistinguishable, however. Why? Ah, the mouthpiece. Of course.